Martín Vizcarra, the Peruvian president, recently made headlines with his response to the brutal murder of a woman by her stalker: “Sometimes that’s how life is.” Unfortunately, given the high rates of violence against women, his inconsiderate response is not far from reality. Feminist organizations have been sounding the alarm about these types attacks for years, but have been met with malicious disinformation and fake news as a result of their work to change ingrained gender norms that endanger and discriminate against women. IWHC grantee partner Promsex has been an ardent defender and advocate for Peruvian women’s rights for 13 years; the organization’s focus on sexual rights, and specifically abortion, has made it a target for right-wing conservatives that have spread misinformation about Promsex’s funding sources and programs in an effort to damage its credibility. However, after a three year legal battle, in mid-June a Peruvian court ruled in favor of Promsex and determined that the two entities in question—Catholic news agency ACI Prensa and the director of the Population Research Institute—had spread false and malevolent content about the organization’s work to advance access to safe and legal abortion, which is tightly restricted in the country. In its decision, the court stated that the defamatory material must be removed and rectified. Further, the court directed that these entities, and others, cannot knowingly disseminate lies or misleading information about human rights defenders—serving as both a warning for anti-choice groups and a significant victory for Promsex and all sexual and reproductive health advocates that face ongoing assaults on their work. This outcome is a result of Promsex’s bold and unapologetic efforts to promote and defend sexual and reproductive health rights and access for the people of Peru. But this is not the only fight they are engaged in. Promsex has been a leader in advancing comprehensive sexuality education (CSE) in Peru with the aim of expanding knowledge about sexual and reproductive health and rights, reducing gender-based violence, and increasing gender equality, including for LGBTQI individuals. These efforts are needed as Peru is experiencing high-levels of violence against women—43 femicides and 103 attempted femicides in the first four months of 2018—and LGBTQI people. In fact, in 2017, the Peruvian government repealed legislation that made violence against LGBTQI individuals a hate crime. Efforts to enact comprehensive sexuality education, including a new national curriculum that features aspects of CSE and a provision against discrimination on the basis of sexual orientation, have been met with fierce backlash. Social conservatives and the religious right launched a campaign, Con Mis Hijos No Te Metas (Don’t Mess with My Children), alleging that feminist and gay groups seek to break down traditional family structures and gender roles. This campaign also includes a legal challenge to the national curriculum. Despite this coordinated attack, the Ministry of Education recently released a statement reaffirming the fundamental value of gender equality and their commitment to its inclusion in the national curriculum. 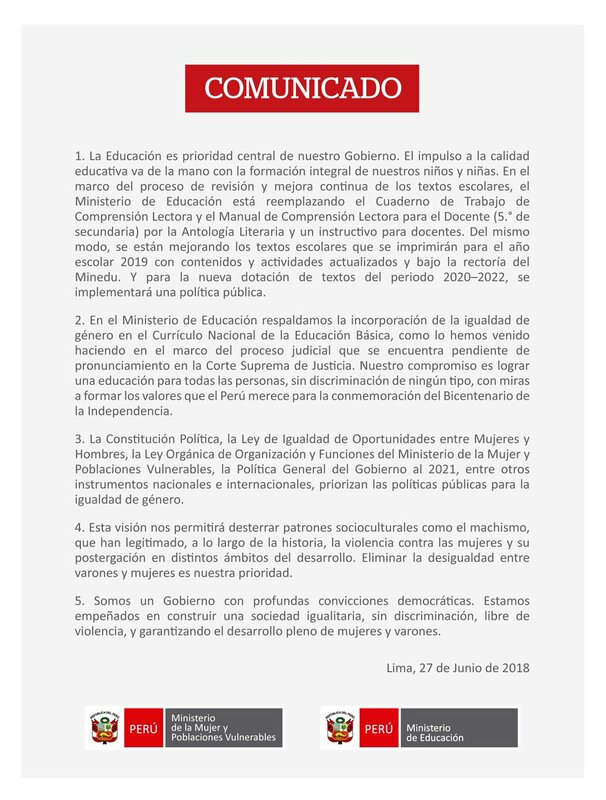 The fate of this curriculum lays with the Supreme Court, which is expected to issue a ruling on the case brought against the Ministry of Education by Padres en Acción (Parents in Action) soon. Founded in 2005, Promsex, or Centro de Promocion y Defensa de los Derechos Sexuales y Reproductivos, is a feminist organization that seeks to improve access to sexual and reproductive health services, advocate for progressive reproductive health policies, and ensure proper implementation of current policies and programs. Using a rights-based approach and scientific evidence, they aim to increase support for reproductive health rights among both government representatives and the public. Promsex serves as the secretariat for the Latin America Consortium against Unsafe Abortion and is active in regional and international groups that aim to improve access to contraception and safe, legal abortion, as well as protect and further LGBTQI rights. IWHC is proud to support Promsex as they confront conservative forces and ingrained gender norms that seek to control women’s bodies and limit access to sexual and reproductive health services and information. IWHC has been a dedicated supporter of Promsex since 2005, and a funder of Peruvian groups seeking to advance reproductive rights since 1989.